The second night of Jamey Johnson’s 2 night stand at The Shed is officially SOLD OUT! That’s right, June 30th is going to be a SOLD OUT show! See ya there! The last TBA slot on the Shed’s upcoming 2018 concert season has been filled by none other that alt country trailblazer Corey Smith! He will make his Shed debut on August 25th! Tickets are only $25 and are on sale now at link below! 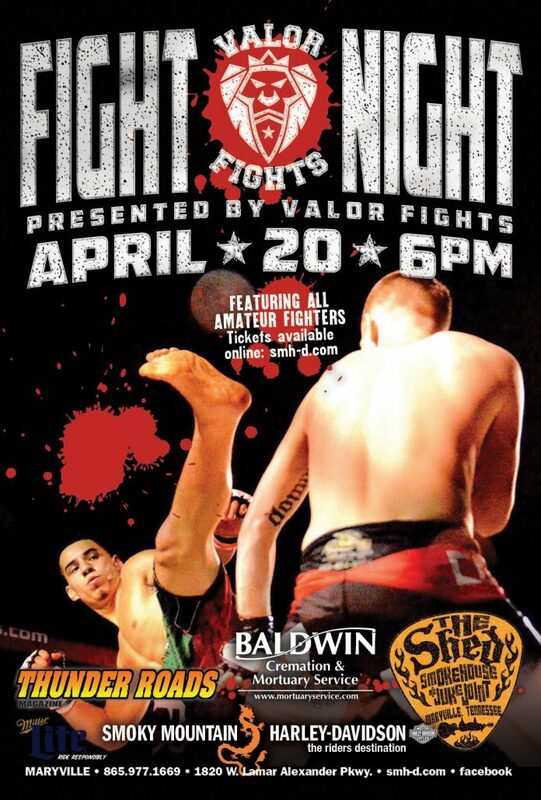 With the event being a month away, Valor Fights has revealed the bout card for their FIGHT NIGHT on 4/20 at The Shed! Check it out! They also expect to add a Men’s Heavyweight Title Fight and am told local hero Olivia Parker is still searching for an opponent. https://www.theshedtickets.com/wp-content/uploads/2018/03/Valor-Fights_Inverted.png 600 600 Joshua M. Formont https://www.theshedtickets.com/wp-content/uploads/2017/10/2633-SHED-LOGO-3-291x300.png Joshua M. Formont2018-03-22 09:35:082018-03-22 09:38:25Valor Fights Match Card Announced! United Way of Blount County is returning to The Shed this year for their 2nd Annual Benefit Concert to fund their outreach program right here in Blount County. Headlining the show will be Knoxville native and Season 15 of The Voice WINNER Chris Blue! Show is set for Friday, July 27th! Tickets will be $30 and will go on sale May 1st! The Aaron Tracy Band, who will be performing at the final Bike Night of the season, will kick off the show! Stay tuned for more details on how you can purchase tickets. https://www.theshedtickets.com/wp-content/uploads/2018/03/Chris-Blue-Slide.jpg 450 1170 Joshua M. Formont https://www.theshedtickets.com/wp-content/uploads/2017/10/2633-SHED-LOGO-3-291x300.png Joshua M. Formont2018-03-19 11:17:442018-03-19 11:17:44United Way of Blount County Bringing Chris Blue to The Shed! The Steel Woods and Scotty Bratcher will be joining Blackberry Smoke this July at The Shed! The Steel Woods are no strangers to The Shed stage. In 2016, they rocked the Smokin’ Monkey Lounge and then returned in 2017 to play the Brothers and Sisters Reunion. This year, they are fresh off an awesome show in Knoxville with Miranda Lambert and ready to return to The Shed with BBS once again! Scotty Bratcher is familiar to the Brothers and Sisters Reunion as well. In 2017, he joined BBS on stage during both nights’ encore performances to play some screaming guitar and share vocals with Charlie Starr. Don’t miss these two great acts during two awesome nights of music! https://www.theshedtickets.com/wp-content/uploads/2018/03/bbs-2018.jpg 808 1600 Joshua M. Formont https://www.theshedtickets.com/wp-content/uploads/2017/10/2633-SHED-LOGO-3-291x300.png Joshua M. Formont2018-03-02 10:08:442018-03-02 10:09:04Brothers and Sisters Reunion Support Acts Announced! 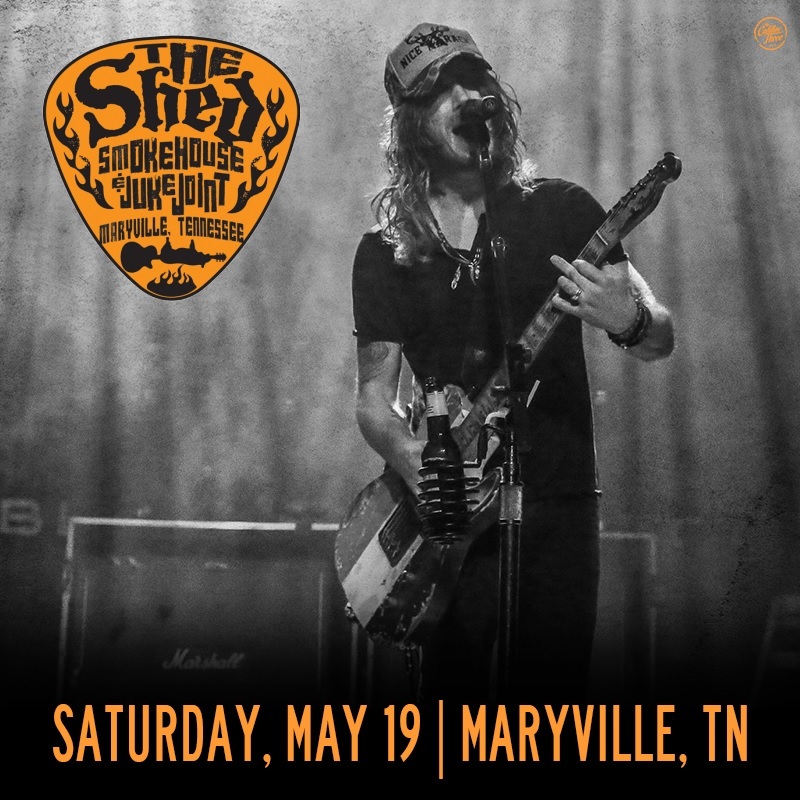 The Cadillac Three are returning to The Shed! Don’t miss out on the epic show on May 19th! We are proud to show off the upcoming 2018 Concert Season’s Schedule! Tickets go on sale for all shows on Friday, 2/9, at 10am! https://www.theshedtickets.com/wp-content/uploads/2018/02/SHEDULE-2018-11x17-e1517840261507.jpg 1146 2535 Joshua M. Formont https://www.theshedtickets.com/wp-content/uploads/2017/10/2633-SHED-LOGO-3-291x300.png Joshua M. Formont2018-02-05 10:07:202018-02-05 10:07:20The Shed's 2018 Concert Season! And before the folks at Smoky Mountain Harley-Davidson on West Lamar Alexander Parkway throw themselves into the planning and organizing of the regional H.O.G. Rally, they’ll throw open the doors for the 2018 concert season, which kicks off April 7. There’s still live music at The Shed during the colder months — singer-songwriters Nikki Lane and Becca Mancari perform an indoor show Friday night in the “Smokin’ Monkey Lounge” — and there are three shows scheduled for February and one for March before the AC/DC tribute band Big Gun kicks off the outdoor concert series. In preparation for last season, Formont and his team updated the lighting at The Shed; this year, the plans are to capitalize on all of the overhead upgrades and put on a season that’s a mix of roots-rock originals and cover bands that play the classics. But hip-hop — along the lines of Yelawolf or country-rap acts — isn’t out of the question for coming seasons. Already, Formont is working on lining up dates for the 2019 season, and last month the venue rolled out the dates for the first month: Big Gun on April 7; Wrecking Crue, a Motley Crue tribute band, on April 14; the Red Not Chili Peppers tribute band on April 21; and Tuesday’s Gone, a Lynyrd Skynyrd tribute act, on April 28. 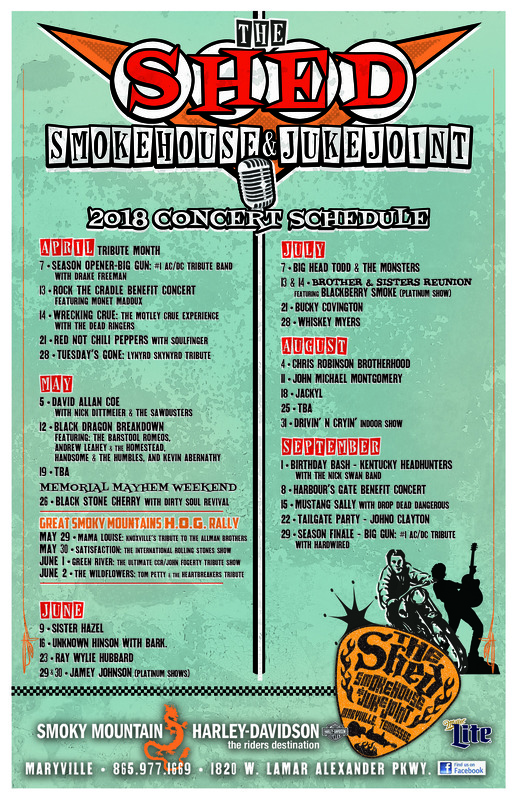 The next weekend kicks off with an outlaw country bang, as David Allan Coe returns to The Shed on May 5; the following weekend, the “Black Dragon Breakdown” will feature a lineup of local acts, including Kevin Abernathy, Handsome and the Humbles, Andrew Leahey and The Homestead and the Barstool Romeos. For Memorial Day, the rock band Black Stone Cherry will headline, and in June, three acts are on the books — Sister Hazel, Unknown Hinson and Ray Wylie Hubbard. The Kentucky Headhunters will return for their annual Labor Day weekend gig, and the Southern rock outfit Whiskey Myers also has a date on the season’s schedule, along with a number of other events. https://www.theshedtickets.com/wp-content/uploads/2018/01/5a5fdf13e18db.image_.jpg 616 1200 Joshua M. Formont https://www.theshedtickets.com/wp-content/uploads/2017/10/2633-SHED-LOGO-3-291x300.png Joshua M. Formont2018-01-18 19:11:582018-01-18 19:11:58The Daily Times Weekend Section Reveals More 2018 Shed Shows! The Shed is going to take cues from the success of 2017’s first tribute month and do it again this year to kick off the season! 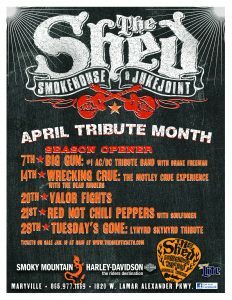 Check out all these awesome shows that are going to be at the Shed this April! Tickets on sale January 15th at 10am! Don’t miss Big Gun return to The Shed to kick off yet another incredible season! For the first time in Shed history, the music of Motley Crue will be brought to life! Also, don’t miss out on the SMH-D Cannonball Run during the day! That’s NOT, not HOT. But you won’t know the difference! THis may be the best tribute band touring America right now. https://www.theshedtickets.com/wp-content/uploads/2018/01/SHEDULE-APRIL.18-8.jpg 3397 2625 Joshua M. Formont https://www.theshedtickets.com/wp-content/uploads/2017/10/2633-SHED-LOGO-3-291x300.png Joshua M. Formont2018-01-08 09:50:382018-01-08 15:07:34Tribute Month Returns to The Shed in April 2018! 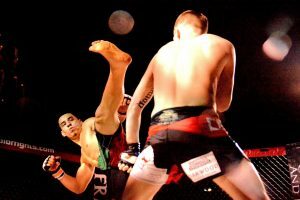 Last time Valor Fights came to The Shed, the crowd was amazed at the level of competition the local southeast fighters provided. So much so, that we have to do it again! 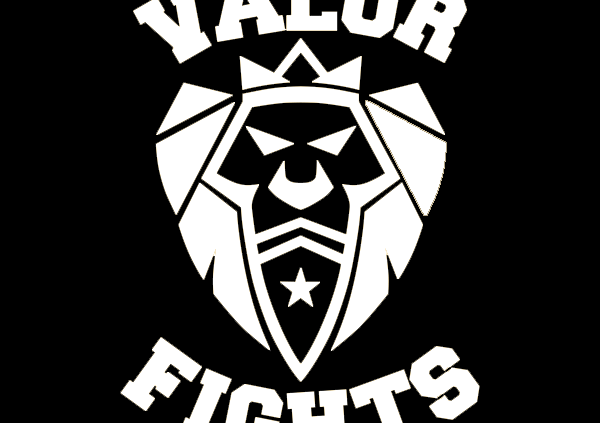 Valor Fights presents FIGHT NIGHT at The Shed! 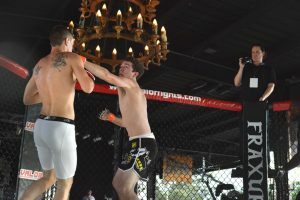 Get smoked with the best amateur MMA action in the southeast on 4/20! $30 GA tickets. Limited seating available, but feel free to bring your own chairs. Advertise your business during the event by purchasing a table. Contact josh.formont@smh-d.com for more information. Check out some pictures from last summer’s event! Tickets go on sale Friday, 1/5. at 10am! This is sure to be one of the biggest events of the spring, mark your calendars now! https://www.theshedtickets.com/wp-content/uploads/2018/01/VF-Slide-1.jpg 450 1170 Joshua M. Formont https://www.theshedtickets.com/wp-content/uploads/2017/10/2633-SHED-LOGO-3-291x300.png Joshua M. Formont2018-01-02 10:33:072018-01-02 10:33:54Valor Fights is returning to The Shed!